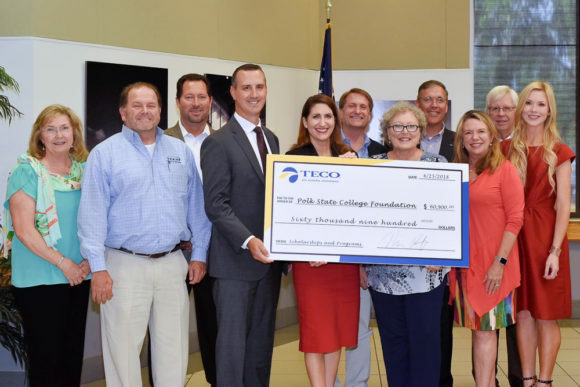 At the June 2018 District Board of Trustees meeting, Tampa Electric Company (TECO) was recognized for its long, meaningful relationship with the College and the Polk State College Foundation. TECO has played a vital role throughout the years in the success of Polk State students through direct scholarship donations, as well as support of College and Foundation events and programs that help students attain their dream of a college degree and enhance the learning experience. The College and Foundation are extremely fortunate to have such an actively engaged company in TECO that assists the College in helping students succeed. Nick Plott, Regional Director for TECO was joined by Rick Jackson, lead line supervisor, and Cindy Price, who recently retired as Regional Director, for the presentation.